A genuine “bucket list” dream trip for many begins in Toronto, a metropolis worth visiting by any mode of transportation, then takes VIA Train No. 1, the Canadian, across Canada to Vancouver. Toronto deserves its reputation as one of the world’s great cities. It is Canada’s largest and most cosmopolitan town. More than 200 ethnic groups speaking over 140 languages call it home. We spent an enjoyable couple of days of sightseeing before our train’s departure in late March. As night falls, downtown Toronto lights up. Getting downtown is easy. After clearing customs at Toronto Lester Pearson International Airport, we boarded the UP Express, a 25-minute train ride to Toronto Union Station. It runs every 15 minutes and costs $12. The station has convenient municipal transit connections, and many downtown hotels and attractions are within walking distance. We enjoyed a narrated hop-on, hop-off bus tour that showcased Toronto’s diversity, architecture, shopping and arts. Don’t miss the CN Towner for lunch or dinner and an amazing view from the revolving restaurant. 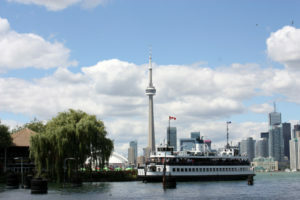 If the weather is nice, check out the waterfront and enjoy a boat tour to see the impressive skyline. 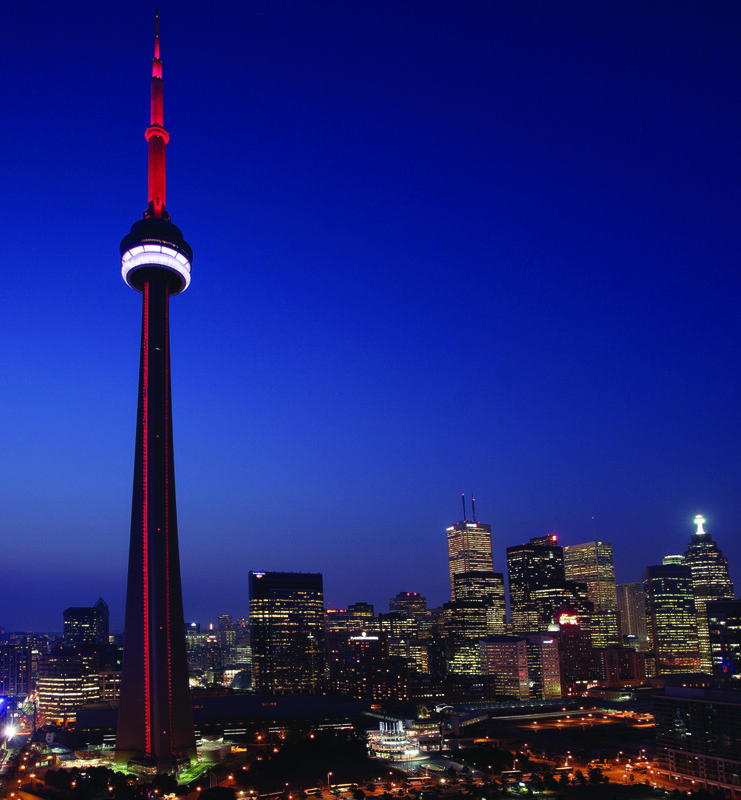 We also recommend a stroll down Yonge Street and the theater district. If you want to visit some of the far-flung ethnic neighborhoods and regional attractions, the Go Transit regional rail network has frequent service radiating in several directions from Union Station. As sorry as we were to leave Toronto, VIA Rail Canada Train No. 1, the westbound Canadian, was scheduled to leave at 10 p.m., so we headed to the station about 9. Fortunately, our Toronto experiences were not quite finished because our night departure afforded a spectacular view of Toronto. It is something not to be missed. The same nighttime view is available from the commuter trains that ply these tracks, albeit without glass domes. As we sipped coffee in the plush departure lounge, it was not long before the “all aboard” call came. Our 2,775-mile transcontinental journey was beginning. 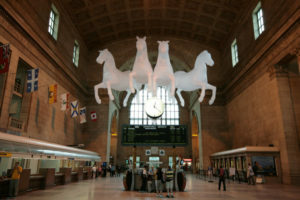 Toronto Union Station features an imposing main concourse. The conductor escorted passengers on a short walk to the platform and directed us onto one of the 17 cars of gleaming stainless steel that would be our home for the next four days. After stowing our bags in a small but nicely appointed first-class sleeper compartment, the car attendant told us about his daily routine of changing the compartment from day sitting room to bedroom and back and invited us to walk four cars back to the last car in the train, the Glacier Park dome lounge, for complimentary champagne and hors d’oeuvres as the train departed. Precisely at 10 p.m. the train began to move slowly. As we glided past the end of the covered station platform, Toronto’s night lights and sights burst into view from our 360-degree vantage point. We slid past the brightly lighted CN Tower and through downtown Toronto while enjoying a unique view of many trackside buildings, some with people in the windows waving to us. As we sipped champagne and munched on a nice selection of passed hors d’oeuvres, urban scenery gave way to the suburbs and then the exurbs. As the city lights receded, our journey across Canada had begun in a memorable way. We retired to our sleeper car, convinced that the rest of the trip on Train No. 1 would live up to and even exceed this auspicious beginning. We were right. 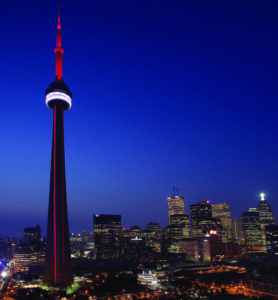 Toronto has the largest Jewish community in Canada. Jewish immigration started in the 1830s, and the community grew in late 19th century and early 20th century as Jews fled Europe’s anti-Semitism. By 1911, the Jewish population was over 18,000. The Jewish population topped 45,000, dominated by Polish immigrants, during the Great Depression. By World War II, it was about 50,000 and was the largest ethnic group in a city with more than 200 ethnic minorities. When the strongly pro-French Canadian Parti Quebecois government was elected in Quebec in 1976 and Quebec independence became a live issue, the mostly English-speaking Jewish population of Montreal felt threatened. As a result, many moved to Toronto, firmly establishing it as the Jewish center of gravity in Canada. As Quebec Jews poured into the increasingly crowded central city Jewish neighborhoods, a Jewish migration to the suburbs marked the decentralization of the Toronto Jewish community, which continues today. The contemporary Toronto community has an active Jewish Federation, day schools, and about 50 congregations in the city and its far-flung suburbs, including many in North York and Thornhill. The Jewish regional population is about 200,000 out of a total population of about 3.5 million. According to the Jewish Virtual Library, about half actively identify with the Jewish community, of whom about 20 percent are Orthodox, 40 percent are Conservative, and 35 percent are Reform. Kosher food and restaurants are available. For observant Jews contemplating a trip on the VIA Canadian in Sleeper Plus class, kosher meals are available with a 10-day-advance request. Toronto Lester Pearson International Airport (YYZ), six miles from the city center, hosts major airlines. 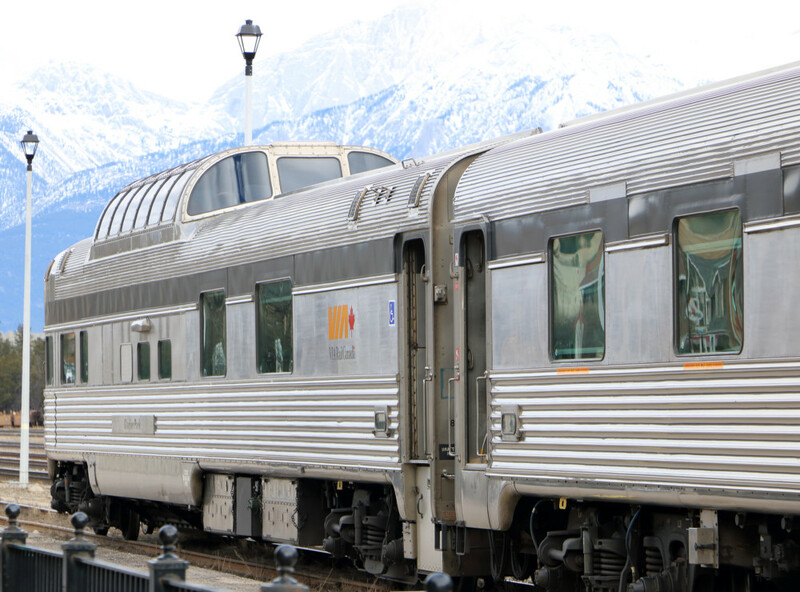 VIA Rail offers frequent service to Toronto Union Station from Canada and a train from New York City via Buffalo. Toronto’s waterfront is a lively place in the summer. Major highways radiate east, west and north from Toronto. The nearest cruise ship port is Montreal, 336 miles away. Yonge Street, Dundas Square and the theater district. • A Maple Leafs hockey or Blue Jays baseball game or a live theater performance in season. • City Hall, the Ontario Legislature (Queens Park), Casa Loma and other notable buildings. • Shopping at tony Eaton Centre. Niagara Falls, which is just 90 minutes away. Niagara on the Lake, Ontario. The Welland Canal locks between Lakes Erie and Ontario. The keys to dressing for long-distance train travel are efficiency, comfort and reuse. 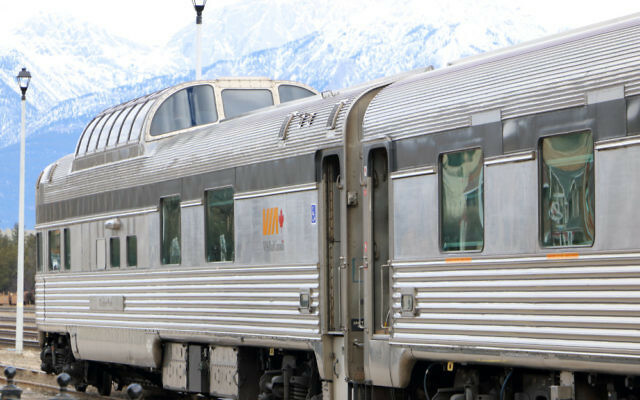 Onboard space is limited, even for passengers with small private bedrooms, and large suitcases remain in the baggage car. Also, you have the option of pre-trip touring and stopovers, some for an hour or two, so pack casual clothes appropriate for the season. Mobility level: Low to moderate. Although touring Toronto and riding on the train require getting in and out of various vehicles, most of the city and the train are handicap-accessible, and alternative mobility options are available. When to go: Any time. Winters are cold, and summers are hot. But each season has its charms. Rail fares increase in the summer. Where to stay: The Fairmont Royal York and the Strathcona Hotel are close to Union Station. Many other choices are nearby. Special travel interests: Canadian culture and scenery; rail travel. Jeffrey Orenstein and his wife, Ginny, enjoy simply smart travel and sharing their trips and tips with you. See their travel tips, photos, articles and blog at www.SimplySmartTravel.com and like them at www.facebook.com/SimplySmartTravel.